Wouldn't it be great if you could do your laundry in your home-away-from-home? Even if you're parked someplace with laundry facilities, it's more convenient to not have to carry baskets and supplies to a separate building, wait for machines to finish, and carry everything back to your RV before you can even start the task of putting away your clean laundry. How much easier and more pleasant is it to start a load and then relax with a magazine or a favorite TV show until it's time to put your nice clean clothes away mere steps from where you did them? 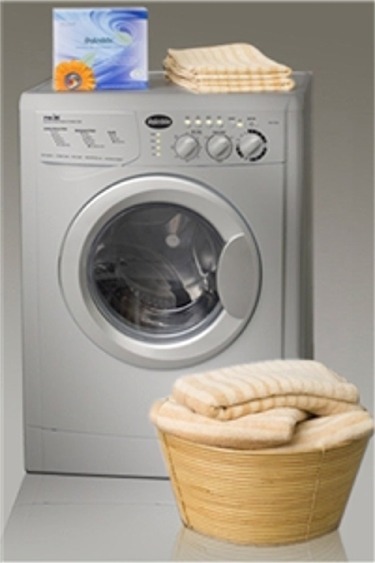 The Splendide XC Combo is a combination washer/dryer in a stylish platinum finish. It has many of the same features as standard laundry machines, is easy to operate, and even features LEDS to show you where the machine is in the washing or drying process. From your finest silk lingerie to soiled jeans, this unit can handle it all. If you forget an item, it even has a feature that allows you to add it part way through the cycle. The motor runs quietly enough that you can let it do your laundry while you're asleep; a process helped by the fact that it automatically dispenses laundry products. If you need to do larger loads and have a bit more room, the Splendide Ariston Stackable RV Washer and the matching Splendide Ariston Vented Stackable Dryer may be just what you need. These full-featured machines are sturdily built for life on the road. Washer features include a delayed wash setting, electronic controls, extra rinse cycle, super quiet operation, and overflow protection. The dryer features an extra-wide door, easy-to-clean lint filter, several temperature options and timed drying cycles, an 'Auto' cycle that senses when the load is dry and stops automatically, and a generous 4 cubic foot capacity. The machines can either stack or sit side-by-side. If you would enjoy the convenience of having your very own laundry facility inside your home on wheels, contact us. We not only have the quality machines you'll want but all of the parts you'll need to get them up and running in time for your next adventure on the road. If you are the type of RVer that goes camping all year round, then depending on the location, you know that this is the time of the year that the weather starts to turn cold. It may be warmer during the day but as soon as the sun goes down the night becomes frigid. Here are a few RV accessories that would be perfect for keeping you warm during the cold nights. There's nothing better than crawling into a nice warm bed on a cold night. Curling up with a thick blanket makes it that much better. 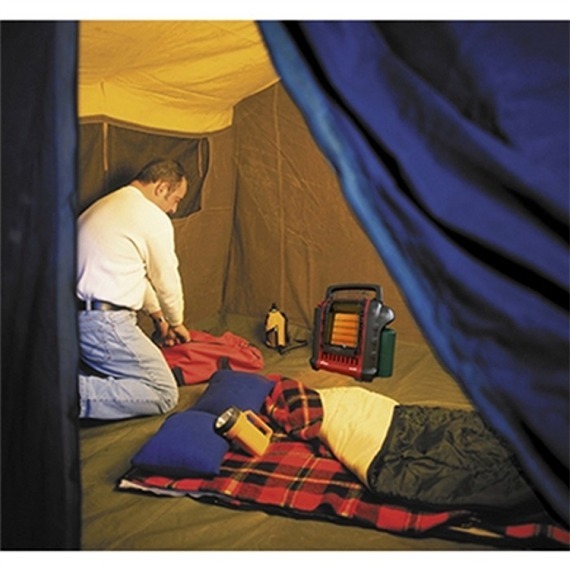 One that is perfect for the RV world would be the RV Superbag Sleep System. This blanket set gives your bed the look of traditional bedding, but has the convenience of a sleeping bag. It includes the sheet and 2 pillow cases and the whole system unzips so it can be washed when needed. This is not your typical comforter, with the sleeping bag feature you won't have to worry about the blankets falling off the bed and you will stay warm the entire night. Make the inside area of your RV cozy with Mr. Heater Heaters, so if it's a chilly night and your not quite ready for bed, sit in the living area and relax while watching some TV or playing a game of cards. These heaters are powerful enough to heat the area of the RV that you need with its different settings. They are also safe with the automatic shut off option for if they get tipped over, there is a low oxygen level or the pilot light is extinguished. If you are fortunate to have a furnace in your RV and need a replacement or you are thinking about having one installed we have many furnaces that would be great. Have the entire inside heated, so you can be comfortable no matter what area of the RV you are in. The last accessory that would be a great idea to have, would be a generator. As you may already know with the cold weather, comes storms, rain or snow. Having bad weather can give you trouble with power at a campground and without it, you will also not have any heat, so it is always a good idea to have a source of back up power. This will at least give you the ability to keep the important things running until the electricity is fixed. 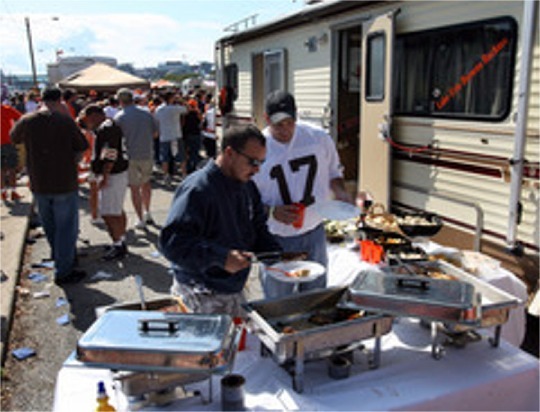 For even more ways to make your next RV adventure more enjoyable during the colder monthes of the year, contact us. We're always glad to help and answer any questions you may have. As you know RV kitchens normally don't have a lot of storage space to begin with, so where do you store all your extra utensils and other cooking supplies? Here are a few accessories to help you create extra storage in your RV kitchen. After all, one of the benefits of having your home-away-from-home is having all the comforts you're used to including a clutter free kitchen. Extra storage will provide room for the tools and utensils you might not usually take camping but would appreciate having, if you had the storage space to bring it. An add-a-drawer kit will mount under cabinets, pantry shelves, tables, or pretty much anywhere else you need an extra 11.8" x 10" x 2" of storage. It takes just minutes to install this RV accessory on either flat or lipped surfaces and even self-locks so you don't have to worry about spillage on the go. For even more storage, choose the extra deep kit; at 12" x 11" x 4" it will allow you to store ladles, whisks and many more of the cooking utensils you need to cook. 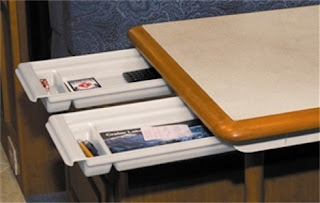 Adding a add-a-drawer table kit beneath the table will make it easy to set for meals. What better place to store silverware and napkins than right where they're needed? Each one is a generous 14 x 8 x 2". You might want to consider adding one to a side table in the living area, too. It will provide a perfect place to stash that remote and newspaper. Kitchen Kaddies are perfect for storing all the little odds and ends that you don't have space for. They are made of vinyl coated wire so they don't rust and they are durable enough to hold whatever you need. There are many different purposes for these racks, including a place to put spices, saran wrap or aluminum foil, cleaners and much more. 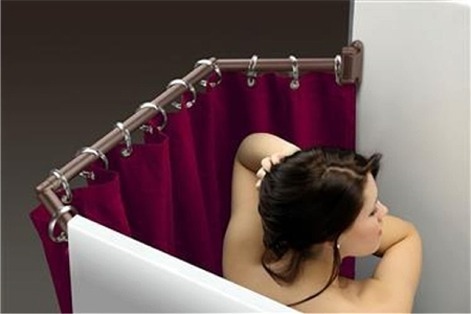 They are easy to install and can be mounted just about anywhere there's a flat surface, from walls to inside cabinets. Another great RV accessory for creating storage in your kitchen is the space saving dispensers. We have many including Pop-A-Plate, Pop-A-Bowl, Pop-A-Towel and many more. These can be mounted under the cabinets and will keep your counter tops clutter free. When you need a plate, bowl, napkin, coffee filter or towel, just pop one out of the dispenser. These RV accessories are just a few of the many products we offer that can help you save space in your kitchen and have more comfort, ease, and enjoyment, while cooking. After all, everyone can use more of that when camping in an RV. If you have any questions, contact us and experience our exceptional customer service for yourself.